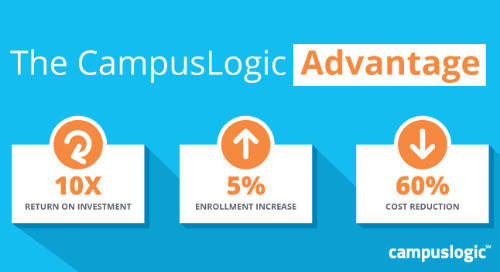 CampusLogic CEO Gregg Scoresby recently spoke with Knowlura CEO Greg Baker about issues affecting enrollment and financial aid offices—and emerging trends that both departments on campus can use to improve the student experience and, ultimately, recruitment and retention. The companies’ mutual focus on changing lives through higher education also makes Knowlura a natural fit as a CampusLogic referral partner. In part two of this three-part blog series, Gregg and Greg (GS and GB, respectively) discuss data, mobile, online learning, and all the reasons why enrollment and FinAid need to work together to make evidence-based decisions for the future. Read on to learn what’s behind the numbers that Knowlura crunches. GS: Colleges and universities have been enrolling students for decades, centuries even, but only recently did they start considering data analysis to improve upon recruitment and retention practices. What have you been seeing among the 30+ schools Knowlura serves? GB: Many school administrators don’t quite know which metrics are important. Obviously, you want to know where prospective students come from, how they heard about the school, and what’s making them move forward—or drop out—of the enrollment process. But that’s just scratching the surface. We look at data throughout the entire student lifecycle—from recruitment to enrollment, to time spent in class or on a task. Our intention is not just to help with admissions, but to ensure the institution is focused on continuous improvement in all their processes and programs. Data will tell you what’s working and what needs fixing. GS: In your opinion, what’s the No. 1 thing that needs fixing? GB: Retention numbers are not given the kind of clout that new-student recruitment gets—and that’s a shame. Retention efforts are much less expensive, year over year, than recruiting new students. Both the enrollment office and financial aid office should be looking at why students are—or aren’t—returning, and capitalizing on that information. GS: What else is data telling your schools to consider? GB: First, that online marketing tools like social media cannot be ignored. I don’t think I have to tell you that—you’re already Twitter- and LinkedIn-savvy. But getting schools to see potential in these tools can be a tough sell. Also, even in the nontraditional, adult-education marketspace, 50% of prospective students are using mobile devices to research, price-shop, and apply to schools. Using text messaging during the enrollment and financial aid process is almost essential today—and it certainly will be in years to come. In both cases, the point is to find the places to spend your money and time most effectively. To do that, you need to know everything that’s going on with your students and prospective students. Most schools don’t have the staffing and throughput to do all that, but we’ll provide monthly or even weekly reporting to ensure they’re on track with their initiatives. GS: Do schools typically have insight into their data before hiring Knowlura? GB: They rarely have the insights to best interpret and act on whatever the data reveals. Without access to a larger, industry-wide view for comparison and analysis, some colleges might think the data they retrieve is meaningless—or negative—especially when analyzing online offerings. Take lead-to-start ratios for instance. In the online education space, anything above 3% is deemed acceptable—meaning of 100 students who inquire, three start the program. But for some universities, that number seems too low to matter, so they don’t follow the data. This is one way we differentiate ourselves—by specializing in this area. We think we’ve built a better mousetrap: We look at every channel with a little more detail. Plus, we’re not distracted by data from other verticals. All we focus on is the not-for-profit, higher education space. By concentrating on this niche, we share a world of expertise with our partner institutions. We’re focused on transparency. We show clients where the data and what it could mean. We believe institutions can do this themselves with a modicum of training. GS: So, you’re telling me there’s a new “Three R’s” in education? GB: That’s right: Recruitment, retention, and research.